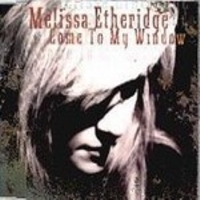 "Come to My Window" is a song by Melissa Etheridge released in 1993 on her 1993 album Yes I Am. This was the first song to be released after Etheridge publicly announced her sexual orientation of being a lesbian. With the driving force of gay rights, the song gained a lot of airplay on radio stations, mostly through call-in requests. The song debuted on the Billboard charts after the first week of its release, reaching number 25 on the chart. The song also charted in Canada, reaching number 13 on the RPM Top Singles chart. It was the second song from Etheridge that earned her a Grammy Award for Best Female Rock Vocal Performance. "I don't care what they think. What do they know about this love, anyway?" Etheridge tells both in her autobiography and during the interview on the bonus DVD of her greatest hits album that out of all songs she has written, "Come to My Window" is the one that surprises her the most, and that she almost did not put it on the album. She states that while she wrote the song, she did not realize what she was actually writing and that it was not before meeting Tammy Lynn Michaels that she understood what this song means to other people.The image and idea of the window came from a scene in the movie Yes, Giorgio. She also says that it has the best musical bridge part of all her songs. The sound effect at the beginning was created by Mauricio Fritz Lewak who put coins inside of a pair of clash cymbals. This song was also about her girlfriend at the time. The black-and-white music video, directed by Samuel Bayer, cuts between a mental patient (Juliette Lewis) and Etheridge playing her guitar and singing. The video also features "child-like" drawings in certain scenes. According to an episode of VH1's Pop Up Video, these drawings were created by a crew member's five-year-old daughter. Additionally, the video was to have included an appearance by a little girl; the mental patient's "lost childhood". While the appearance was filmed, it got lost during editing. Etheridge performed "Come to My Window" during The Concert for New York City, the benefit concert following the September 11, 2001 attacks. Early during her performance, her microphone failed, leaving Etheridge to play her guitar without singing while an alternate mic was found. Famously, the audience, made up largely of members of the New York City fire and police departments (and survivors of NYPD and FDNY personnel who were lost in the attacks) sang the lyrics themselves until Etheridge's mic was restored. The song was played by the World Wrestling Federation in the background of a tribute to fallen wrestler Owen Hart. In 1997, The John Tesh Project featuring Brandon Fields on saxophone, covered the song from their album "Sax All Night." ^ "Top RPM Singles: Issue 2407." RPM. Library and Archives Canada. Retrieved 16 March 2018. ^ "Melissa Etheridge Chart History (Hot 100)". Billboard. Retrieved 16 March 2018. ^ "Melissa Etheridge Chart History (Adult Contemporary)". Billboard. Retrieved 16 March 2018. ^ "Melissa Etheridge Chart History (Adult Pop Songs)". Billboard. Retrieved 16 March 2018. ^ "Melissa Etheridge Chart History (Mainstream Rock)". Billboard. Retrieved 16 March 2018. ^ "Melissa Etheridge Chart History (Pop Songs)". Billboard. Retrieved 16 March 2018. ^ "RPM Top 100 Hit Tracks of 1994". RPM. Library and Archives Canada. Retrieved March 28, 2019. ^ "Billboard Top 100 - 1994". Archived from the original on March 1, 2009. Retrieved August 27, 2010. ^ "American single certifications – Melissa Etheridge – Come to My Windo". Recording Industry Association of America. If necessary, click Advanced, then click Format, then select Single, then click SEARCH. ^ "Sax All Night overview". Allmusic.com.